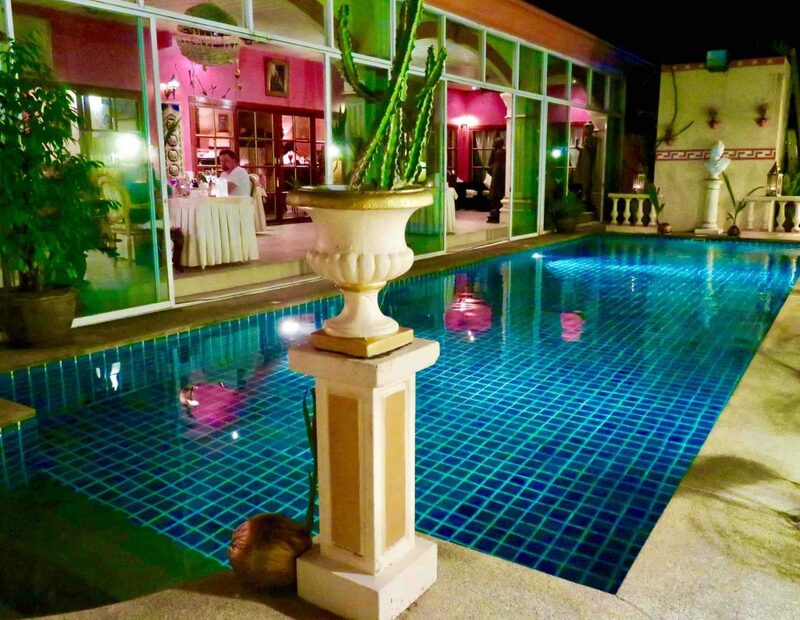 Gay Phuket update: Restaurant Royale Nam Tok in Phuket, Thailand is a class act from start to finish. 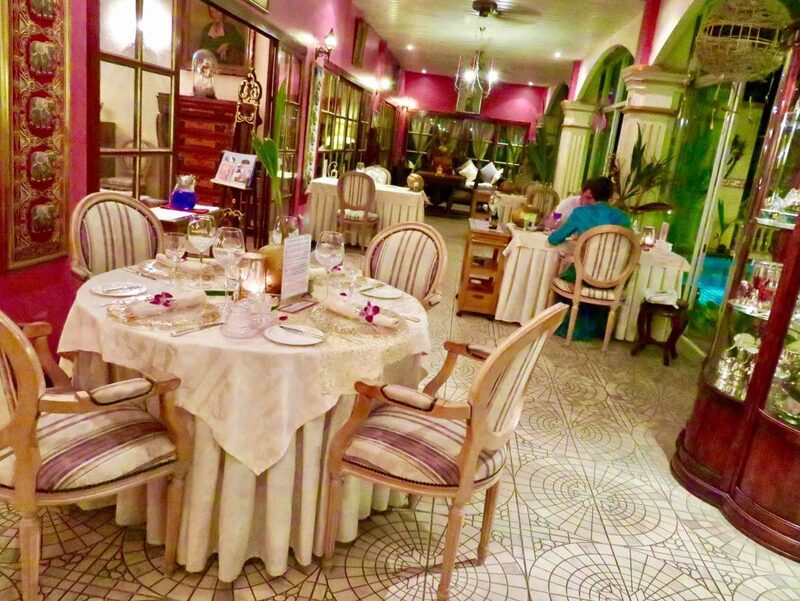 The sumptuous dining space, superb service by host Corry and the culinary distinction of Chef Marc are usually hallmarks of the finest European Michelin Star restaurants. Their exquisite home by day and restaurant by night, with only six tables, lavishly set with fine French napery, antique silver cutlery and elaborate glassware, could only be described as distinguished opulence. On arrival we enjoyed the sultry sounds of famous French divas while sipping pre-dinner champagne cocktails in the tropical pool garden before being served an amuse bouche of mushroom cappuccino. The menu varies throughout the year. An appetiser of large plump scallops fried in ginger and served in a rich pumpkin soup was delectable. The house speciality, Champignons á la Madeleine, features mushrooms stuffed with a secret recipe belonging to Marc’s aunt and they are seriously delicious. Grandmother’s Pot-au-Feu (rabbit stew) in a white wine sauce with two mustards and tarragon was a wild French treat and the sauce was so good you could have bathed in it. Canadian Lobster and fried turbot filet in lobster bouillon sauce, with coconut milk from Marc’s own garden, was also sensational. Sipping French Sauvignon Blanc from the Loire Valley we studied the á la carte dessert menu. What a dilemma, everything sounded so enticing. Marc suggested the surprise dessert medley to share. How could we go wrong with a master chef in the kitchen? Luscious petit fours served on top of an ornate glass bowl containing Siamese Fighting Fish was a touch of finesse to complete a perfect dinner. Story and photos by John Walker & Gavin Patterson, ManAboutWorld correspondents who blog here and on GayMenonHoliday.com. They visited this restaurant in Phuket and found it wonderful and quite unique. It is owned by two lovely Belgian men who packed up their European restaurant and transported it to their new home in Thailand. For more gay Phuket and Thailand recommendations, download the free ManAboutWorld guide to Thailand available for iOS and Android devices.